A trade name of the generic drug fexofenadine, Allegra is an antihistamine that counteracts the actions of histamine in the body. This reduces the symptoms of allergies that can interfere with daily life, such as sneezing, itchy eyes, and watery eyes. Allegra D contains pseudoephedrine as well fexofenadine to also alleviate the symptoms of nasal congestion. The regular tablet is taken by mouth once or twice a day and should be taken with a full glass of water. The liquid suspension formula must be shaken and precisely measured. Some individuals may receive Allegra ODT, an orally disintegrating tablet formula that is dissolved in the mouth rather than swallowed whole. An extended release tablet is available for patients who take Allegra D. This pill must be swallowed whole to be effective and cannot be crushed, chewed, or broken. Before 2011, fexofenadine medications were only available with a prescription. 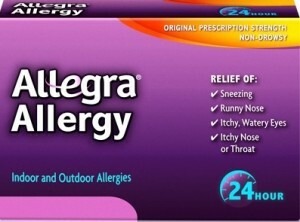 Allegra and Allegra D are now available over the counter and are intended to treat the symptoms associated with seasonal allergies in adults and children. Allegra may also be recommended to treat the symptoms of the skin condition urticaria, including hives and itchy, raised patches on the skin. Claritin (Loratadine) is generally used to treat allergies, it can also be used to treat runny nose and sneezing associated with the flu and the common cold. Cetirizine is the generic name for the brand name Zyrtec and is a medication that is used to treat moderate to severe allergies, cold symptoms or chronic hives. Benadryl, known generically as diphenhydramine, is a very common antihistamine available both over-the-counter and as a prescription injection. The brand name of a nasal spray containing the generic drug mometasone, Nasonex is a corticosteroid that is inhaled through the nasal passages to reduce swelling and inflammation of the membranes in the nose.